Summer is here. The sun is shining, the shorts are out and friends and family are getting together to enjoy the garden BBQ. But this time you’re in charge. And if you’ve reached this page, it could well be that you after a few BBQ tips to make sure everything goes to plan. Don’t worry, you’re not alone. This summer, BBQ feasts right across the US will be plagued with cremated sausages, uncooked yet scorched chicken breasts and the odd out of control fire or too. The fact is, cooking over the BBQ grill takes a bit of skill. However, the good news is mastering those skills is far from rocket science. 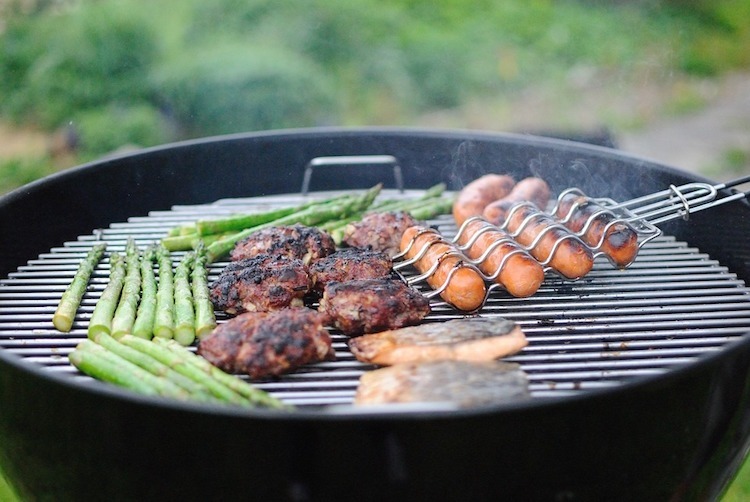 The trouble is, if you get too good, your friends and family will be inviting themselves around every weekend to enjoy all that your backyard grill has to offer. You have been warned. This first step may seem so obvious, but it is amazing how many people neglect the most fundamental issue of all; owning the right barbecue. First off, it has to be a charcoal one. While there is nothing wrong with a gas BBQ, (and yes they are more convenient) you cannot hope to achieve the same smoky flavours. Point number two – put a lid on it. A barbecue with a lid gives you the ability to lock in flavours, while keeping the temperature constant. It also allows for extra techniques such as melting cheese on your burgers or smoking out the ribs. Delicious. It doesn’t stop at getting the right barbecue, you also need the right tools to go with it.A decent fish slice is a must if you don’t want to lose slabs of meat of the back of the grill. A thick oven glove is another must if you don’t want the smell of singed hair to put off your guests. And of course, the main tool of any self respecting BBQ master are the tongs. A good pair will provide the level of control and reliability that you need when conducting the perfect backyard BBQ. Simply heading to the gas station to pick up a bag of charcoal doesn’t cut it if you want thr ight fuel for your grill. The bottom line is, the type of charcoal you use can have a big impact on the way your food tastes. We recommend lumpwood charcoal above all is. It’s easy to detect this type, the coal inside the bag looks like lumps of burn tree. This is purer, the natural charcoal will give your steaks the best flavour, with none of the chemical aftertaste that cheaper charcoal can cause. Pro Tip: try adding wood chips as part of the fuel. Hickory and oak go well while cooking fish and pork. Cherry and apple wood add a sweetness to many BBQ meats. Waiting for the right time to cook is a massive variable if you want a perfect BBQ. You should wait for the flames to die down. The coals should be white hot, (i.e grey and glowing.) This will provide the hottest most even heat to cook above. 5. Too hot to trot? Hold your hand about 12cm/5inches above the grill. All you need to do is see how long you can hold it there comfortably. 0 seconds = Your hand is probably on fire. A cardinal sin when it comes to barbequing is to forget the fish. Too many people do this which is quite simply a travesty. There’s no reason that a gourmet fish meal cannot grace your BBQ grill. Buy a whole fish from the market, slice it open and stuff with lemon, dill and pepper. The result will be glorious. Marinating is a very important aspect of the best barbeques. If you want to ensure that your ingredients are not overridden the smoke, you should actually continue to add any marinade that you made as you cook. Brush your meat or fish with that delectable sauce throughout its time on the grill. This will add moisture, trap the smoke flavour within the meat, and caramelise the outside so that everything glistens on the plate. Okay, so the average BBQ is an excuse to bring out the caveman in all of us – they are supposed to be carnivorous affairs. However, there is still room for grilled vegetables alongside the meat based mayhem. Grilled vegetables complete with charring marks of the grill bars are an essential part of your BBQ. Slice your veggies into thin strips and grill without oil or seasoning. Once they have softened up and are ready to eat, put them on the serving plate and sprinkle on a bit of quality olive oil or vinegar. Along with steaks, burgers are an integral addition to any BBQ. However, enough of the prepacked sliced offerings from the supermarket. Get yourself to the butchers, buy some quality ground beef and make your own. All you need is salt and pepper and that aforementioned meat, pack into burger shapes and place on that grill. The end result? Well how does juicy, thick flavoursome burgers cooked to perfection sound. Because that’s you, and your delectable BBQ cuisine. Finally, there’s the issue of the slides. And although they rest here at number 10 in our list, they should no way be seen as an after thought. Sides make up a huge proportion of what you eat with a perfect BBQ, (think at least half). The classic potato salad, has to make an appearance of course, but there’s also corn on the cobs, couscous, toasted buns and flat breads, and of course a variety of vegetable salads. Without these your meal is just a meat sweat feast with out the broad range of flavours required to be the perfect BBQ. So there it is. Follow these 10 steps and you will be the BBQ king of the family, without a charcoal-black sausage in sight.